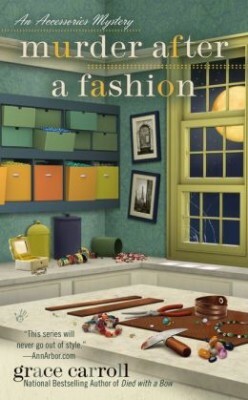 This week we are reviewing several new Penguin mysteries with similar themes-Fashion or Food! 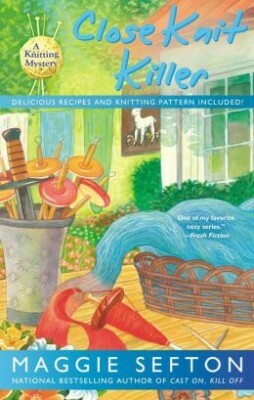 Murder after a Fashion: An Accessories Mystery by Grace Carroll, Thread and Buried By Janet Bolin, Close Knit Killer: A Knitting Mystery By Maggie Sefton, Mayhem at the Orient Express By Kylie Logan and Steamed to Death: A Gourmet De-Lite Mystery By Peg Cochran. Details on how to win all five at the end of this post along with a link to purchase them–with part of the sales going to help KRL keep bringing you great mystery fun! Rita Jewell loves fashion, San Francisco, and her job selling clothes and accessories out of Dolce, the clothing boutique owned by Dolce Loren. However, a rare rainy day that washes out her perfectly put together outfit also drowns Rita’s spirits and puts her in a mood that has her questioning her purpose in life. Having moved from Ohio less than a year and still without a permanent man in her life, Rita finds herself in an emotional down-spiral that spurs her to impulsively decide to sign up for additional cooking lessons with Guido Torcelli, rising celebrity television chef and highly demanded instructor at Tante Marie’s Cooking School. Unfortunately, Guido brushes off Rita’s extremely informal request and when he’s found dead the next day the phone number Rita hastily scribbled on a menu leads the police right to her. Considering Rita’s state of mind, this is actually a good thing as it puts Rita back in contact with Detective Jack Wall, whom she finds attractive when he isn’t interrogating her as a murder suspect. As many times as Jack tells Rita that he definitely does not need her input, she is more than eager to add her two cents and provide him with enormous amounts of unsolicited and frequently unhelpful advice. A conflict of interest for Rita is that her primary suspect is “mostly-a-friend,” Meera Petrescu, occasional pizza shop employee and self-acclaimed Romanian vampire who loathed Guido and accused him of stealing her recipes. Always outfitted in the perfect attire for every investigative occasion, Rita and Dolce crash Guido’s funeral and evaluate the attendee’s fashion choices and motivations for wanting the chef dead. As much as Rita laments her discontent with the state of her life, she does have two other contenders for the role of suitor in her life. Jonathan Rhodes is a busy doctor who treated Rita in her first murder adventure and who proves to be a childish patient himself. He only manages to fit Rita in for cafeteria lunches at his hospital while Olympic gymnast hopeful Nick Petrescu recovers from a training injury long enough to take her out for tea, but none have managed to make a greater commitment in her life. Rita herself is more than ready to commit to any number of suppositions or theories regarding the murder, be they an elaborate suicide scheme by Guido or a jealous brother or other relative involved in a competing food business. It would be easy to write off this third in the series as being too fluffy for being inundated with designer names, clothing lines and fashion trends, but Rita’s very-pre-midlife crisis adds a layer of dimension to the novel and makes her a much more sympathetic character. Rita views the world through her fashion-clouded eyes and she dresses up for each occasion just as if she were playing an ever-changing role. The murder gives Rita a purpose and meaning in her life that she has been lacking, even though she works in a job that she absolutely loves. Rita reads people through their clothing and ultimately aiding in her admittedly very amateurish, impulsive and occasionally intrusive detecting. The past and the present mixed with seemingly random events leads to murder and mayhem in Threadville. Snoozy Gallagher, owner of the hotel where a jeweler’s convention was held thirty years ago, disappeared, and so did most of the jewels from the hotel safe. Rumor had it that Snoozy was living the high life in Mexico but no trace was found. Did Snoozy hide most of the loot before leaving town and sneak back for the treasure? Old bones found at the lodge hint that Snoozy might have been in town all along. Willow Vanderling, owner of In Stitches, a machine embroidery shop, finally has the chance to move Blueberry Cottage to a more stable position on her property. Left as is, it might just end up in the river. During construction there, a rusty box is found–could it be the missing jewelry? But that’s not all that’s going on in town. There are long lost relatives, a yarn bomber, a sidewalk sale, a shoplifter and a thief, stolen vegetables (really) and some very ill people. Was it the flu or food poisoning? When one person dies, was it food poisoning or just poison? Willow and her fellow stitchery friends have their hands full. To top it off, there’s romance in the air and in multiple locations. When Sally, one of Willow’s dogs, adopts two kittens, things really get interesting. Haylee’s mother and her two best friends are referred to as the Three Mothers, not just for Haylee but Willow too. They are odd people but only to the point of quirky, not over the top. The setting of so many stitchery shops all complimentary of each other while still being unique makes the reader want to go to Threadville and wander the streets. This is the third in a series and readers will want more. Reading a Kelly Flynn Knitting Mystery is always feels like a reunion with old friends. Although they’ve endured breakups, accusations and even murder, the friends still come together for decadent breakfast at Pete’s Cafe, softball games, pizza dinners and of course, friendly knitting. When Pete Wainwright’s grandfather suffers a heart attack and Pete steps up to take care of his niece, Cassie, the friends rally around to organize shifts of activities for the eleven year-old girl who has already had too much instability in her life. Over ten years ago their small town of Fort Connor, Colorado, was devastated by a financial scheme that destroyed families and cost lives. The man responsible, Jared Rizzoli, has recently been released from prison and claims to want to make up for his crimes by offering free financial planning seminars. Fort Connor has neither forgotten nor forgiven him though and Kelly is shocked when she witnesses Barbara, one of her most trusted knitting friends, angrily confront Rizzoli and learns that Barbara again attacks him at one of the seminars and must to be escorted off by security. The timing is unfortunate for Barbara as soon after, Rizzoli is found murdered in his parked car across from their beloved Lambspun knitting store. While Barbara’s father committed suicide after losing all of their savings due to Rizzoli’s Ponzi scheme, their family was not the only one devastated by Rizzoli’s actions. Malcolm, a former financial analyst, lost his firm, home and wife, and eventually spiraled into alcoholism due to Rizzoli and even though he has slowly rebounded from homelessness, Malcolm is definitely on the list of suspects for the murder. Wanting to protect her friends and with a solid record for solving murders Kelly does what she can to find alibis and discover which of Rizzoli’s many victims wielded the ultimate revenge. Sefton’s eleven Knitting Mysteries are always a guilty but deserved pleasure to be enjoyed over a relaxing weekend with good food and be reacquainted with old friends. Kelly and her boyfriend Steve Townsend have moved in together, Marty Harrington and Megan Smith are newly married and looking to build a home together, and the rest of their friends continue to grow and support one another. They tease one another constantly, but always come together in a crisis and their caring for Cassie is yet another example of their love for one another. The mystery always plays in the background and as is unfortunately common when the victim is universally unlikable, the killer is someone who is surprising and all too sympathetic. This is a very reliable and well-written series that always entertains with good humor, an entertaining plot and charming characters. This is the first in a new series which will focus on classic books with a new twist. 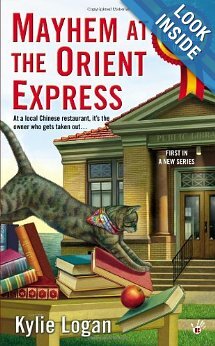 In this case, the Orient Express is a Chinese restaurant, very popular for the orange-peanut chicken (sorry to say, no recipe for this in the book). It all starts when Bea Cartwright moves from New York to Put-In-Bay (South Bass) and opens a B&B. Neighbor Kate Wilder objects to all the trucks and construction, Chandra (formerly Sandra), the hippy dippy neighbor objects to Kate’s choice of music–opera on Sunday mornings, top volume. Kate hates the chanting and wind chimes Chandra finds soothing; Bea objects to Jerry Garcia, Chandra’s indoor/outdoor cat. Basically, they are all on each other’s last nerve–and that’s getting on Judge Alvin Littlejohn’s nerves after they’ve all filed complaints against each other. In a burst of creativity, he sentences the three of them to weekly book discussions for the next year. A book club is a condition of funding for the library. They are joined by Luella who is just there to read and talk. When the women abandon the discussion and rush out the door, they all end up at the Orient Express for to-go dinner. It seems they do have something in common after all. Once in the door, they have two things in common–a love for orange-peanut chicken and the fact that they just found a dead body. Reminiscent of the book they’re discussing, Murder on the Orient Express, there are many suspects, many motives and no solutions. Just like in the book, a snowstorm strands the police officer, the suspects and the women who investigate, all in the B&B. There was one plot twist I picked up on as soon as it was mentioned. A lot of good it did, I completely missed the reason behind it so the murderer stayed a mystery until the end. The characters are enjoyable and I look forward to a stay at the B&B when there’s no snow storm! Other series by this author–the Button Box Mysteries and coming in October, the Chili Cook-off Mysteries. It seems like fate when, just after discovering a burst pipe that shuts down the water in her kitchen, health food caterer Gigi Fitzgerald is offered the opportunity to move into her client Felicity Davenport’s home to act as a chef for her out-of-town guests. The aging soap opera star of Gone but Not Forgotten is planning to revitalize her career by losing weight and stage a “coming out” party where she will reveal her thinner, more glamorous look. To aid her endeavors, she has also hired Gigi’s friend Sienna Paisley, a former New York publicist who now owns the book store, Book Nook, in Woodstone, Connecticut but who also can’t pass up the opportunity to earn some additional money now that she is expecting her first child. Unfortunately, when Gigi is welcomed into Felicity’s home by her co-star Alex Goulet with the greeting, “Welcome to the madhouse,” she soon learns that he speaks the truth. Guests include Felicity’s stepson, Derek, who may or may not be purloining cash from her purse, rival ingénue Vanessa Huff, Felicity’s manager Don Bartholomew, and her hedge fund manager husband, Jack Winchel. Tensions start to rise even before Felicity’s party, as tabloid pictures hint at an affair between Felicity and Sienna’s husband. Vanessa seems to be poaching on Felicity’s manager, who may or may not be having an affair with them both, and Jack keeps meeting with very sketchy men in dark suits. Gigi realizes how fickle fate can be, when Sienna discovers Felicity dead in her sauna and thus finds herself in her own hot seat with the police. Detective Bill Mertz was previously intent on proving Gigi guilty of murder and while his intentions towards her now seem more amiable and amorous, he has no choice but to follow the evidence that all points towards Sienna as the murderer. Although Gigi is distracted by the opportunity to develop her own brand of healthy frozen foods for Branston Foods and the need to cater daily meals for her clients, she cannot ignore the needs of her best friend whose worries with the police could endanger her pregnancy. While Gigi alternately fights and gives in to her attraction to the detective, she has no problem interrogating witnesses and guests while she prepares food for Felicity’s funeral and meals for those still staying at the Winchel mansion. In fact, people seem all too willing to give up information to Gigi despite any qualms about confidentiality to their clients, including one paralegal and even medical workers with loose tongues. Nevertheless, Gigi steamrolls through her investigations with Mertz taking the surprising stand of accepting her input, even as he warns her off for the sake of her own safety. 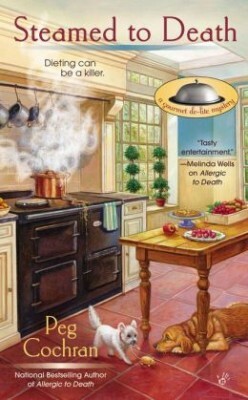 This is the second in the Gourmet de-lite Mystery series and it continues to follow the path of being a cozy, light-hearted mystery full of tasty descriptions of refreshingly low-fat foods with their recipes included at the end of the novel. While the culprit is easily identifiable early on the motive is not, so readers will be entertained as Gigi and her friends examine the many individuals who had reasons for wanting the soap opera actress dead. The introduction of a seductive bounder of a restaurant chef adds an element of romantic rivalry for Gigi’s affections although Mertz is given ample opportunities to reveal his more vulnerable side. This is a frothy and tasty mystery treat sure to please fans of foodie mysteries. To enter to win a copy of all 5 Penguin mysteries, simply email KRL at krlcontests@gmail[dot]com by replacing the [dot] with a period, and with the subject line “Food & Fashion,” or comment on this article. A winner will be chosen July 20, 2013. U.S. residents only. what a nice & generous selection for a giveaway!! So nice to see all these cozies getting attention. This is a genre that often gets ignored by reviewers, but not by readers! I would love to read these! Cozies are so fun, and I always pass them along to my grandma when I’m finished with them! Great sounding books. Cozy mysteries are my favorite genre! Thanks for the give away! I enjoy reading about new cozy series, new to me anyway. Cozies are my favorites! Thanks for the reviews! I’ve been an avid “reading fan” of the first 4 authors since their first books. I’ve never read Peg Cochran but after the review I’m looking forward to adding her to my “favored” list. I really enjoy Janet’s books and am intrigued by the others as well. What a great set of books. I’m especially looking forward to Mayhem at the Orient Express! 5 great authors! Would love to have these books. What a great selection of books. My mother and I always love a cozy mystery! Love that Peg’s book has a Westie on the cover! What a wonderful group of books. Have read a book by Janet Bolin. The other books are all on my to read list. Love reading cozy mysteries! These cozy mysteries are wonderful and would complete my summer reading perfectly. Thanks for this great giveaway. Great selection of books. I have read Janet Bolin and Maggie Sefton and love them. Thanks so much for the chance at this giveaway! Great giveaway. All of the books look great. Don’t know which one I would read first. What a great selection of books – I love cozies! Great bunch of books. All are on my TBR list. 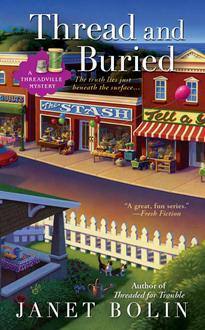 I love cozy mysteries, and this looks like a great selection! What a great selection of books! Would love to read them all. Love these authors! Would love o win these!